Use the catalog link below to find part numbers. Type the part numbers into the "search" box on the upper right side of this page to check pricing and availability. For Scarabeo 250 OEM Parts Diagrams Click Here! OEM Aprilia Scarabeo Top Box for '99-'04 Scarabeo 150, and '04-'06 Scarabeo 250. 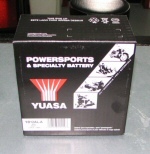 YUASA powersports battery for '99-'07 Scarabeo 150, 250. OEM Aprilia Brake Lever -#8133809 Rear brake lever for '04-'06 Scarabeo 250, '03-'05 Atlantic 200, and '07-'09 Scarabeo 200. OEM Aprilia Anti-Return Valve -#8104251 (ex 8102741) (ex AP8102985) For '01-'03 Mille, Mille-R, '02-'05 Tuono, '01-'06 CapoNord, '01-'04 Futura, '01-'04 Atlantic 500, and '03-'06 Scarabeo 125,200, 250. OEM Aprilia Rad cap w/ vent -#8201463 For '99-'05 RS50; '03-'06 Scarabeo 125,150,200,250; '01-'04 Atlantic 500; and '03-'06 Scarabeo 500. OEM Aprilia Engine Manual .PDF Download This is a factory engine service manual for '06 Scarabeo 250. OEM Aprilia Turn indic.lightbutton cap -#8127180 (ex AP8127482) For '99-'06 Scarabeo 125, 150, 200, 250; and '01-'04 Atlantic 500. OEM Aprilia White Hose clip D12.5x8 -#8102239 Clamp is marked "CLIC 86 No 125"